I am so thankful for the rain yesterday! We needed it so badly! My lawn and flowers have really taken a beating with the heat and drought. My big urn out back in particular looks very sad. It’s time to spruce it up for fall! The sun is out and the yard is calling my name. I made a trip to the grocery store and nursery to get the goodies for my big urn. I purchased my fountain grass and the decorative kale at the nursery since those items are harder to find elsewhere. 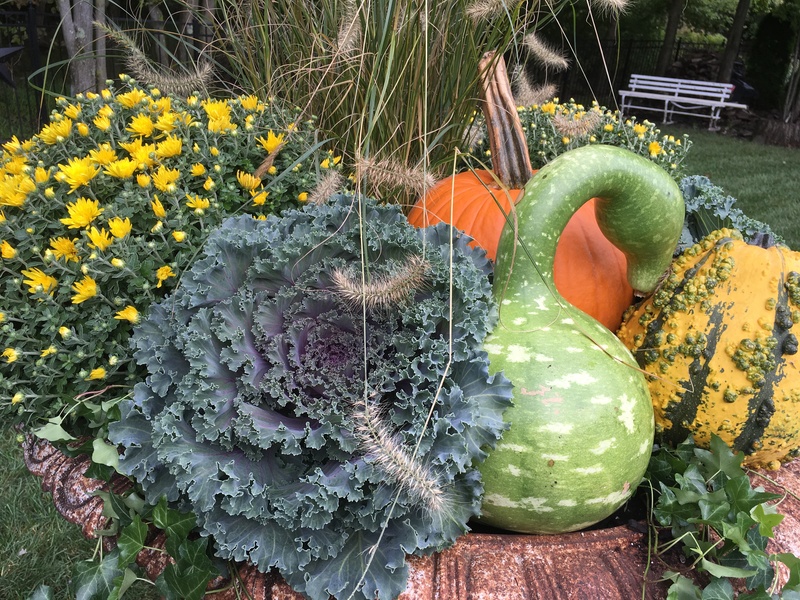 Most of the mums and gourds came from the grocery store. Time for fall planting! I pulled everything out. The lone survivor was my Mandevilla so I will re-pot it. It should last until the frost. I had to empty the urn and dig out the potatoes and roots from the sweet potato vines. I decided to plant an ornamental grass in the middle of the urn. (the thriller) Usually I plant a tall annual in the middle but this time I’m trying my luck with a perennial dwarf fountain grass. Fingers crossed it will last through the winter so I can use it again next year. This was the big ticket item, $29.99, but since it’s a perennial, I think it’s worth it. I mixed in a few yellow mums and two ornamental kale plants. (my fillers) I added some ivy around the edges. (the spiller) I put a big pumpkin and two gourds in the front for added color. This arrangement usually lasts until the frost and usually coincides with the closing of the pool. (always a sad day for Lacey) While I was busy planting, Lacey was playing with one of her frogs. Now when we look out the window or sitting outside we can enjoy the beautiful color and textures of fall!